This is a story about carriers collaborating to improve freight capacity at a good rate. Empty miles have a crippling impact on carrier profitabilty. Let's say 20% of road miles are empty. For a carrier with 5 million annual miles, that's a million empty miles. Assuming all-in operating costs of $2 per mile, the carrier is eating $2 million in expense. Every carrier has the problem, but not every carrier is wiling to do one key thing that could solve the problem: share their delivery networks with other carriers and receive the same from them. When carriers that normally compete decide to collaborate to drive down empty miles, they become more profitable and shippers gain access to more freight capacity at a better rate. 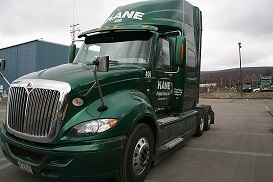 KANE has chosen to partner with select competing carriers, like Road Scholar, for mutual benefit. KANE doesn't share rates, just route information. It's early stages, but the initiative is paying major dividends as formerly unprofitable or marginal lanes have become profitable. This strategy is the exception across the trucking industry, not the rule. Old school approaches still dominate, despite the advance of technology and all the talk of collaboration. "They might steal my customers" is the typical rationale for keeping customer lists and delivery networks close to the vest. Today's shipper appreciates carrier partners who think out of the box and drive value in new ways. In a tight capacity market, carriers are likely to simply say "no" to deliveries with little chance of a backkhaul, rather than risk losing money on the lane. This leaves shippers like you scrambling to book the load. Carriers need to abandon old-school thinking and work together to serve the customer. Technology makes it very easy to share data and identify capacity sharing opportunities. We just need to overcome our own fears and work with, not against, competing carriers. How about your carriers? Are they saying "no" to more loads? Or are they looking at new ways to deliver freight capacity at competitive rates?